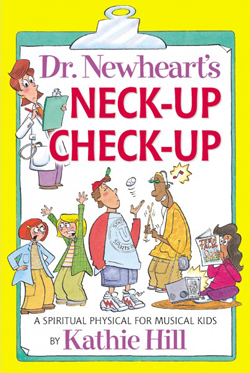 Dr. Newheart's Neck-up Check-up : Kathie Hill Music, LLC, Making music with and for kids for over 25 years! In Dr. Newheart's Neck-up Check-up, the children's choir is anxious to depart for an overnight trip. But, before they leave, Dr. Newheart arrives to complete a last-minute "neck-up check-up." Assisted in this "spiritual physical" by her colleagues—ophthalmologist Dr. Seymour Eisenmind, audiologist Dr. Huachu Hearasaya, speech therapist Betty Bitterweet, and sports specialist Dr. Hedda T'skya—Dr. Newheart gives the children a Biblical perspective on how God would have us use our eyes, ears, mouth, neck, and mind. Through a massive dose of humor and generous prescription of Scripture, this musical will help children and adults know how to keep their minds pure and their thoughts turned to the Lord. One of my all time favorite musicals! A big hit with the children and the audience. The spiritual truths presented prompt all of us to daily give ourselves a spiritual "check-up". Thank you Kathie for keeping this musical available! "Dr. Newheart's Neck-up Check-up" is one of the very best musicals we've ever done. This is the second time we've used this wonderful work. Kathie's music is exciting, singable, and easy to learn and contains a great Biblical message. The characters are fun and kids can really relate to the plot. I highly recommend you use this musical with your children's choir. It's outstanding! A MP3 audio download of stereo recording of 10 songsw/license to make 3 copies - Additional copies require purchase of additional 3x license/s.